NHL Hockey was the first hockey game to be released on a true 16-bit console, and until its release hockey fans had to make do with games like “TV Sports Hockey” on the Turbo Grafx 16 and “Blades of Steel” on the NES. NHL Hockey was a huge step forward from all previous hockey games. The game includes all 22 teams that existed during the 1990-1991 season plus all-star teams, but due to the lack of an NHLPA license players are referred to by number only. Although it is not possible to play a complete regular season (due to the lack of a battery backup), it is possible to play a complete playoff season using password-based game saves. The game has two 2-player modes. Not only can you and a buddy play head to head but you can also be team mates either in a single game, or throughout the playoffs. Overall, this game is fun to play as long as you’re using a good team, as the players on a bad team will all handle as though they are wading through 3 feet of water. I used the Red Wings, who were not yet a great team in the early 90’s, and I had a very hard time with them. Once I switched to using the Penguins (the reigning Stanley Cup champions in 1991), it was like night and day as I dashed around the ice. My two main gripes with the game are the bad AI and the frequency and bad timing of fights. Great AI is not to be expected in a sports game of this age, but NHL Hockey really puts on its dunce cap by regularly passing up open-net scoring opportunities, skating away from the play, and skating right past loose pucks. As for the fighting, while an actual hockey game might have one fight all night, NHL Hockey has multiple fights per period. Furthermore, the timing of the fights adds to the lack of realism. It interrupts the flow of the game and gets old fast. You can turn off penalties, but there is no way to disable the fighting. You can also turn off-sides on and off, select period length, and decide whether or not you want the ability to change lines. With line changes off the players will not become fatigued, but you are then limited to which players you have at your disposal. 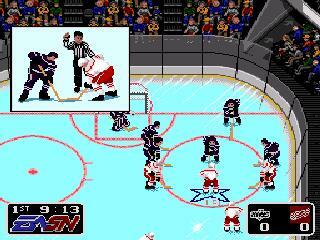 NHL Hockey is a great step forward from the hockey games of the 8 bit era, but it still leaves much to be desired. At the time it was released however, it was the only game in town and I’ll take this game over Blades of Steel any day. Buy NHL Hockey on GameGavel or Amazon. Tagged genesis, Hockey, NHL Hockey, Review, sega, Sports. Bookmark the permalink.